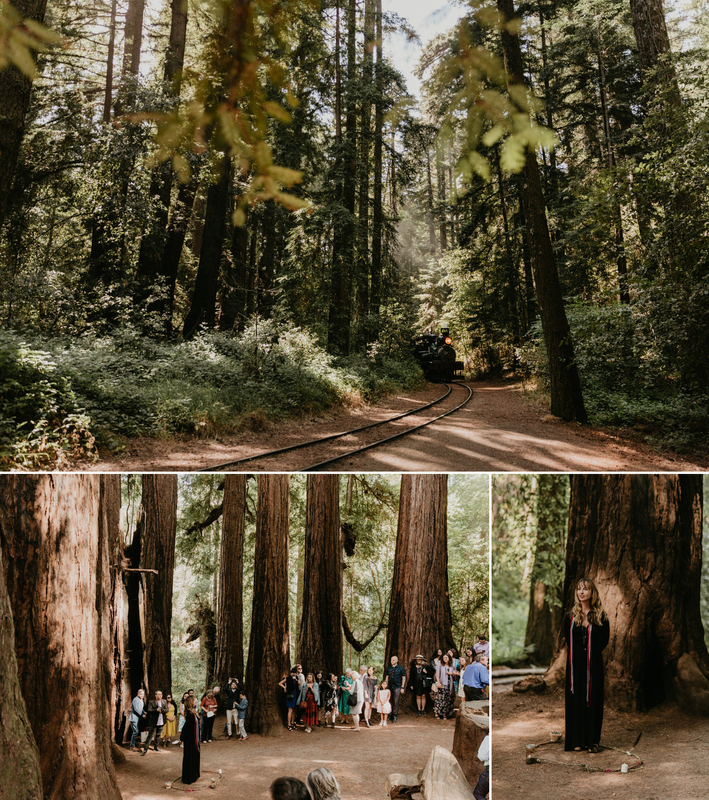 Gayle and Eric’s wedding in the Santa Cruz Redwoods at Roaring Camp was surrounded with wildflowers, laughter, love, and fresh air. 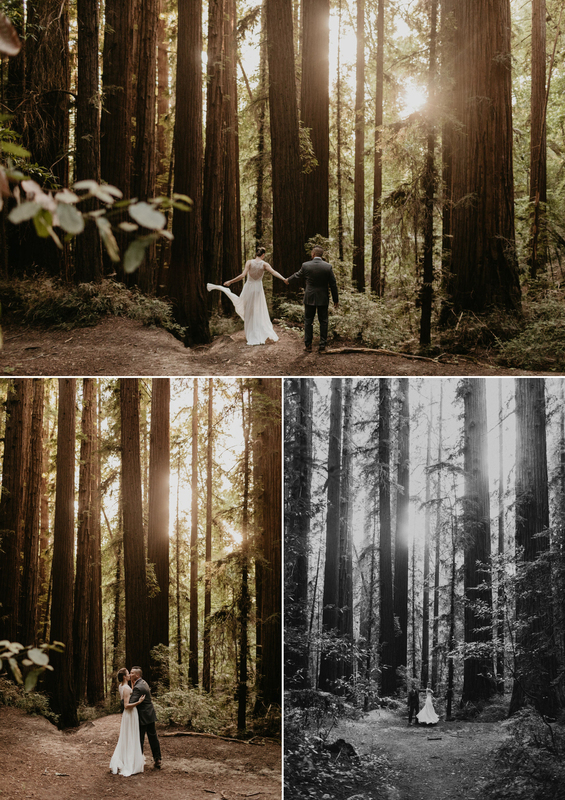 Although they live in Los Angles, they decided to get married in Santa Cruz because a trip to the Henry Cowell State Park stole their hearts on a roadtrip they took up the California Coast. 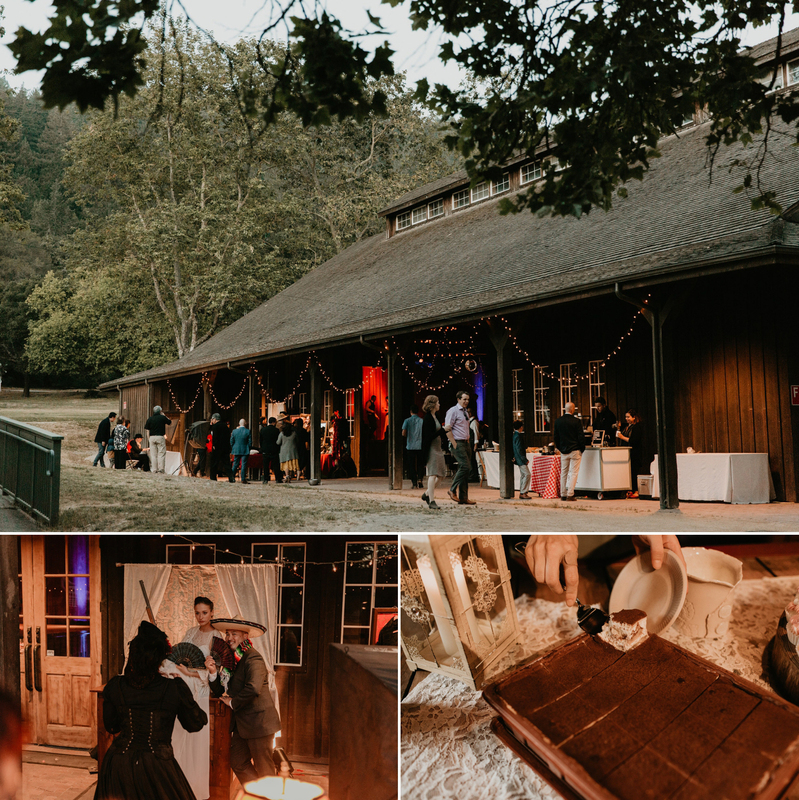 Right next to Henry Cowell Redwoods was their venue, Roaring Camp. 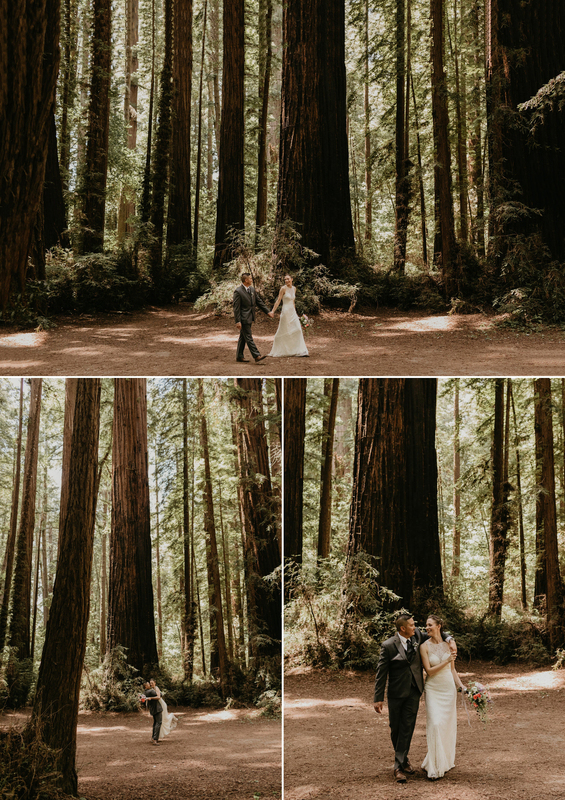 Redwoods only grow like this along the foggy coast of Northern California and some parts of Oregon so they really wanted to start their forever in Santa Cruz, amongst the Redwood giants. 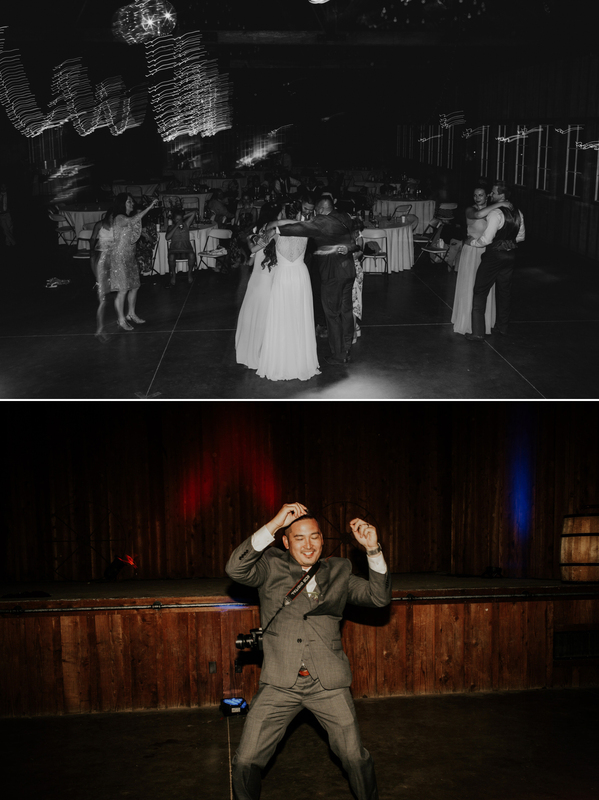 Gayle and Eric were introduced by Gayles good friend and Erics step-mom, Sachi. 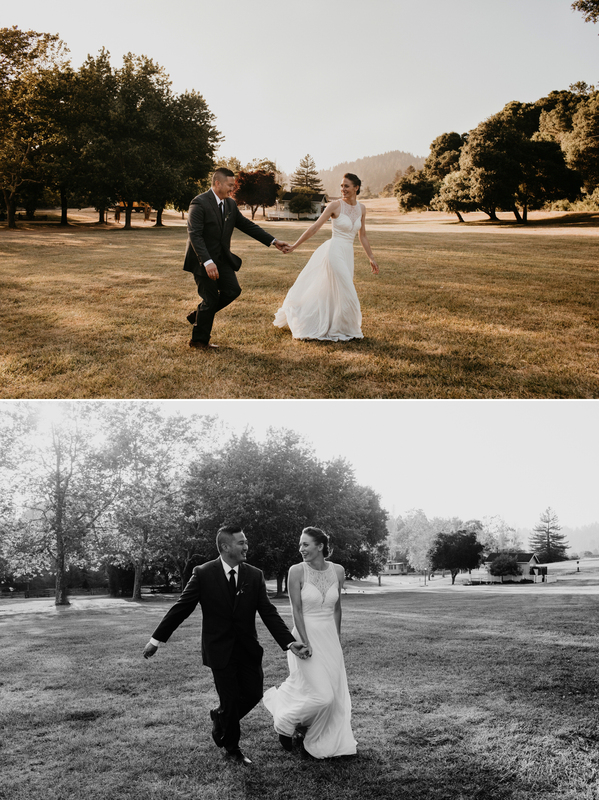 They were friends in the beginning of their relationship, Eric needed a roommate and Gayle wanted to move closer to work, so they moved in together. They lived together as friends for 2 years and really got to know everything about each other. 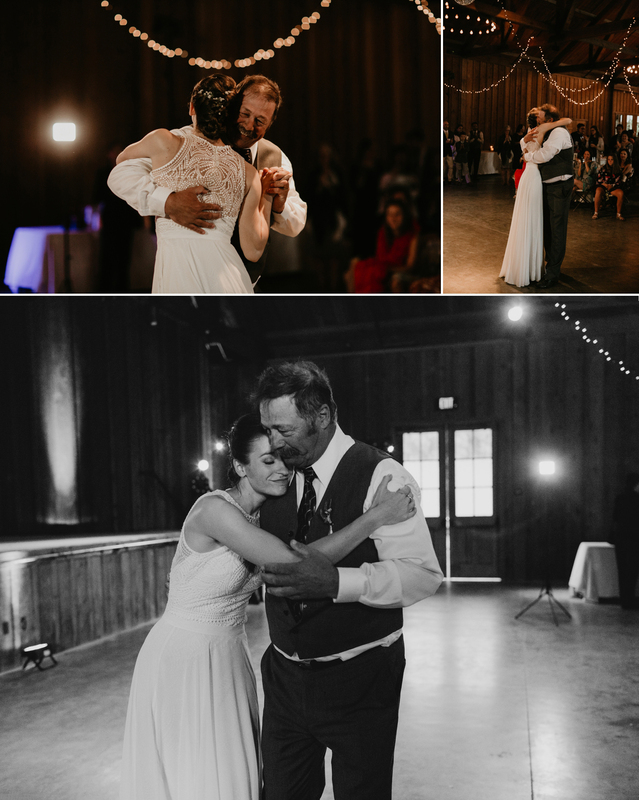 Eric had a crush on her and would sometimes poke his head around corners saying, “you know we’d be great together…” She soon fell in love with how caring and loving of a person he was. Of course, when it happened, they were so great together. 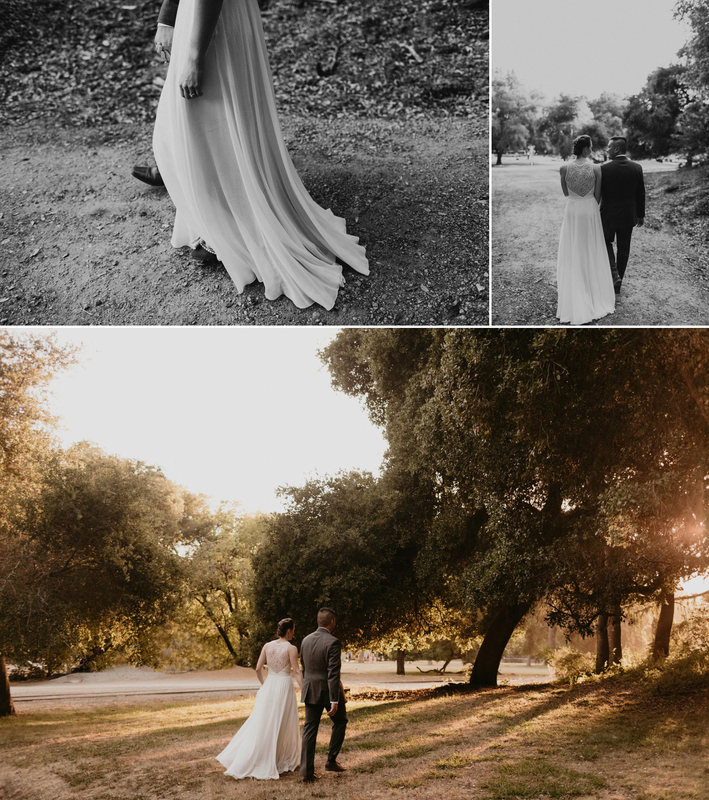 They are so steady and unwavering as a couple. 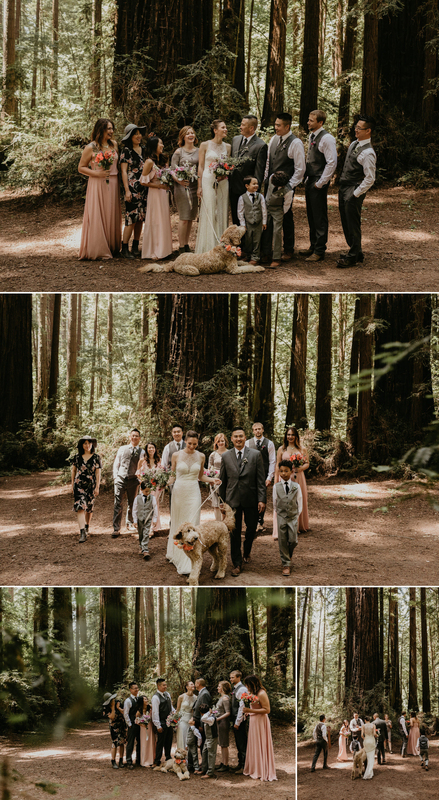 They have a beautiful family with two adorable boys and a golden doodle. All of their decor choices were heartfelt and completely true to who they are as people. 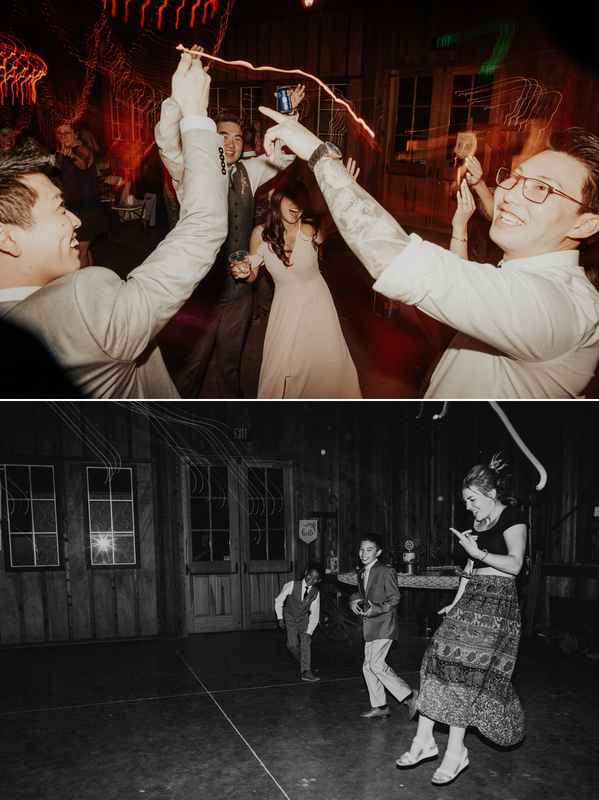 It’s fitting, because they are two of the most genuine people I’ve ever met. 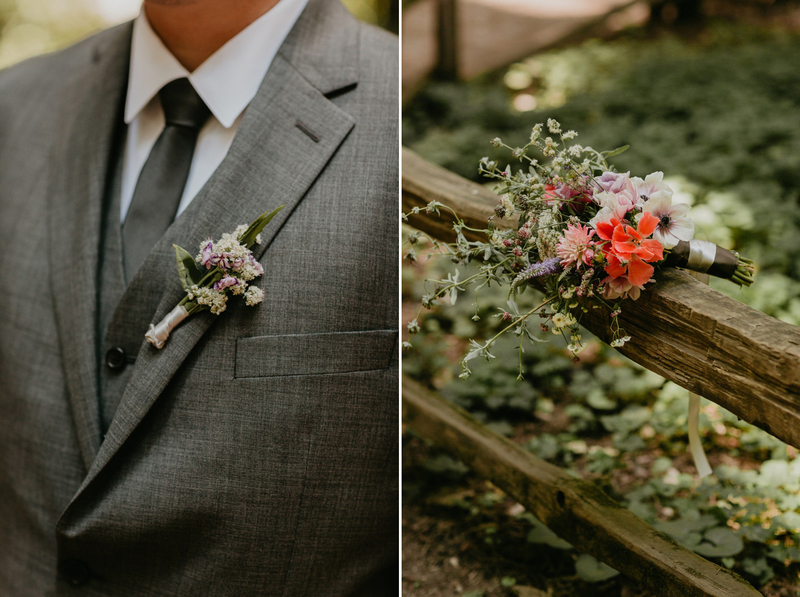 She loves to grow California native flowers and plants at home, so she gathered some of her garden to put into their centerpieces and for her bouquet. 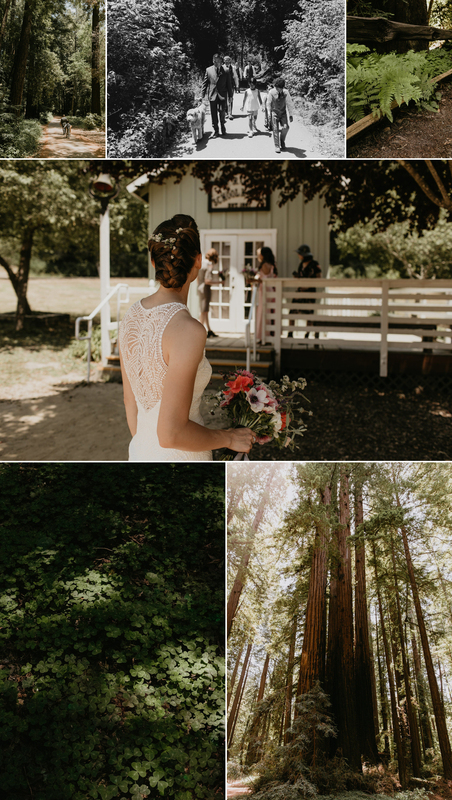 Once she got up to Santa Cruz, she went to the farmers market and picked out a few fresh blooms that were local to the area and added them in. 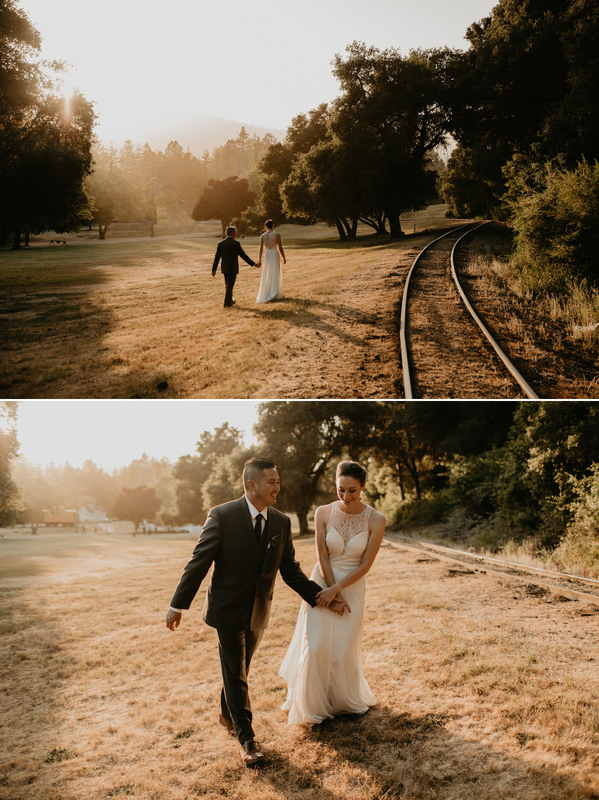 I loved the mix of all the California wildflowers. 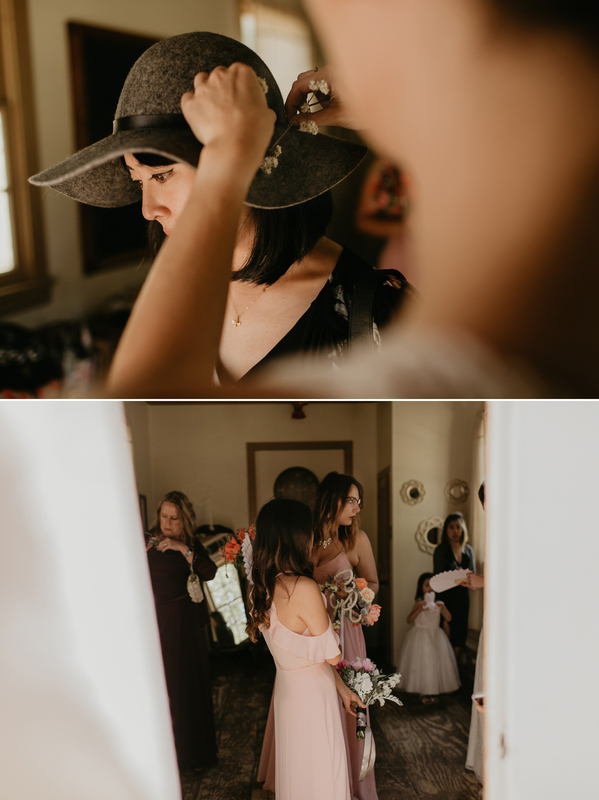 She opted for mix-matched bridesmaid dresses so her friends could pick out their own dresses they loved, a favorite look of mine. 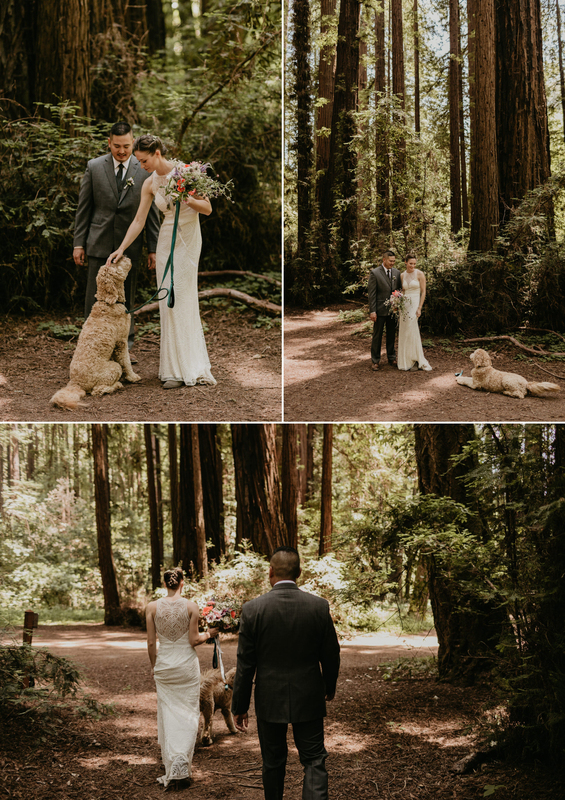 Their sweet teddybear-like dog Primrose was their flower girl. She is also named after a California Native flower. 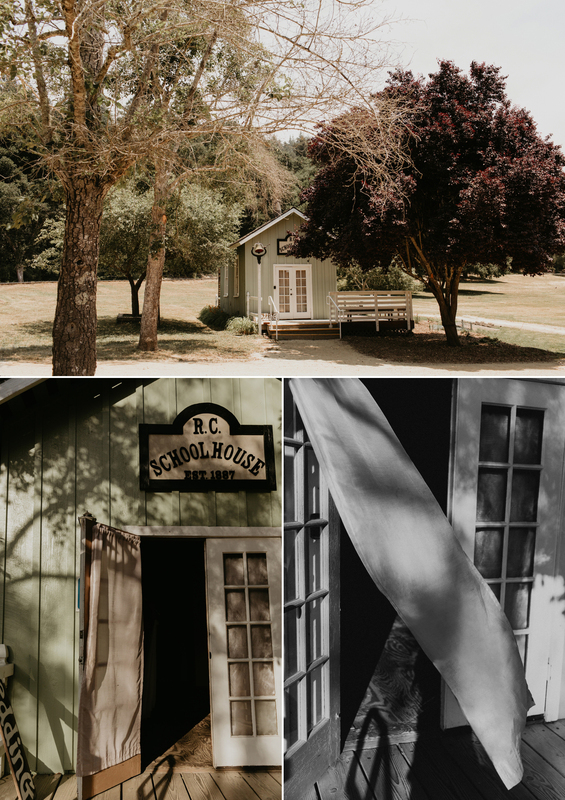 When planning their wedding, they really focused on building a day that would create memories for everyone there, rather than packing the day with structured and traditional events. 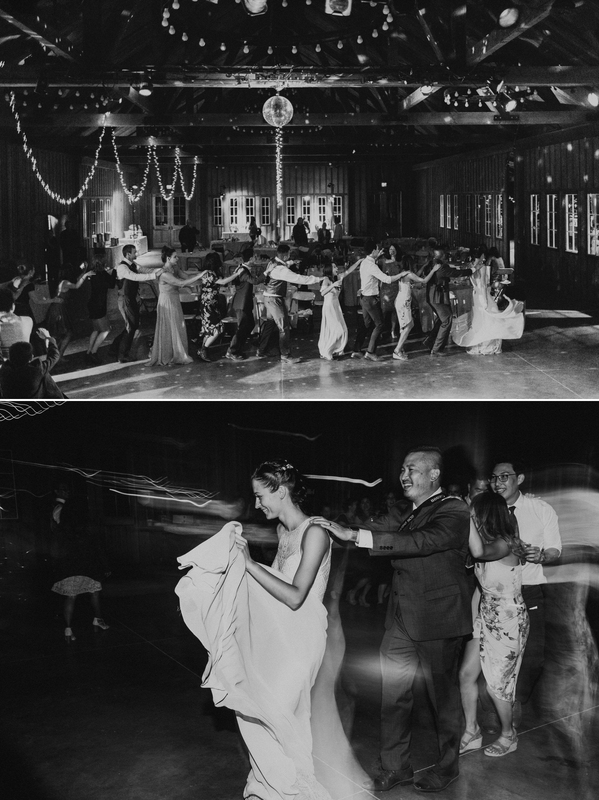 So they threw tradition out the window and just focused on what the heart of a wedding is, love and community. 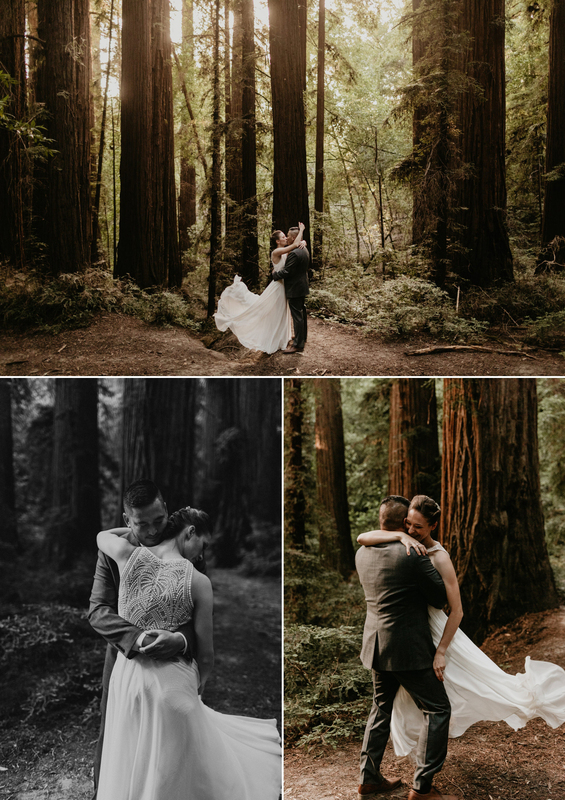 Since the Henry Cowell Redwood State Park was so special to them I really wanted to make it a part of their day. 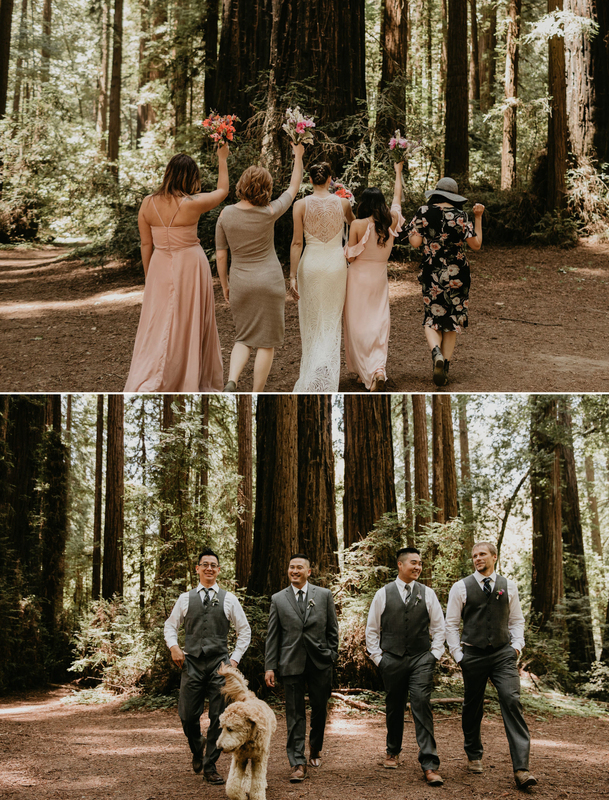 We decided to do the first look there and giver her friends and family an opportunity to appreciate some of the largest and oldest redwoods that exist. 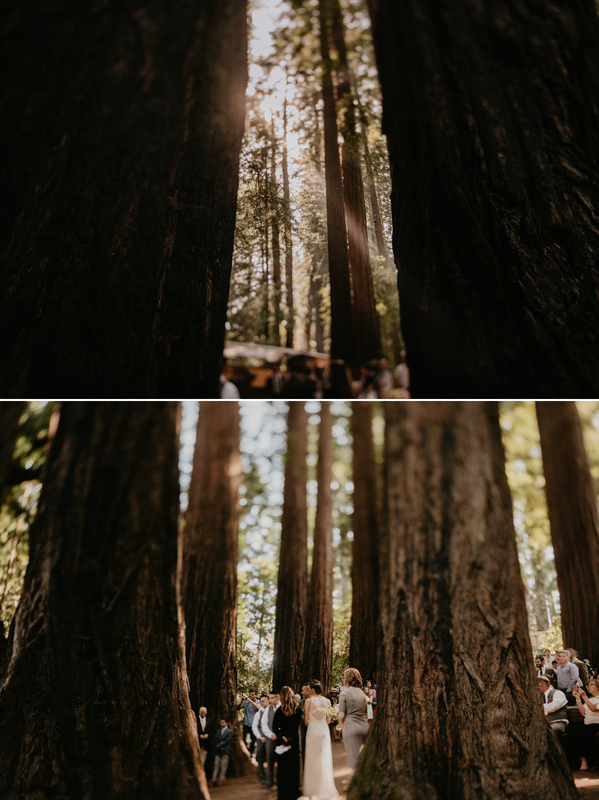 As we walked into the Santa Cruz Redwoods we couldn’t believe how stunningly tall the trees were. 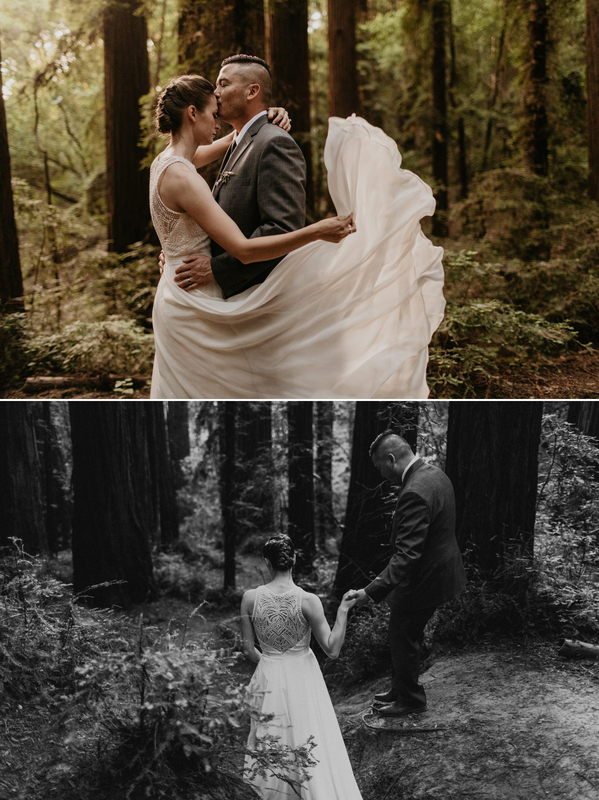 When we got to one of my favorite spots I had her friends and family stop and just enjoy the forest while I took the bride to do a private first look. 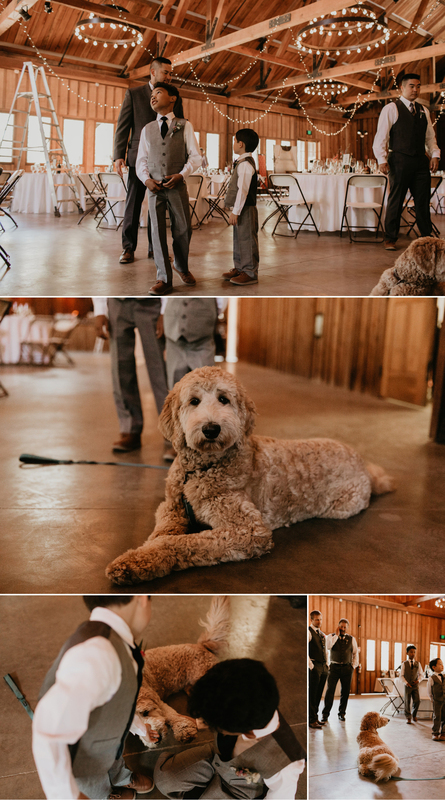 She did a first look with her dad, her dog, and then the groom. Just wait til you see it, your heart will melt. 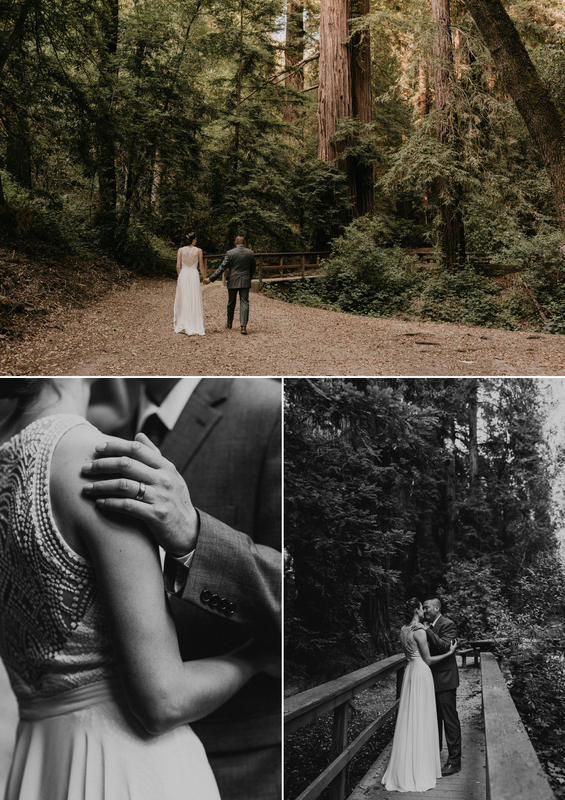 Following the first look we walked back over to Roaring Camp to get ready for the ceremony. 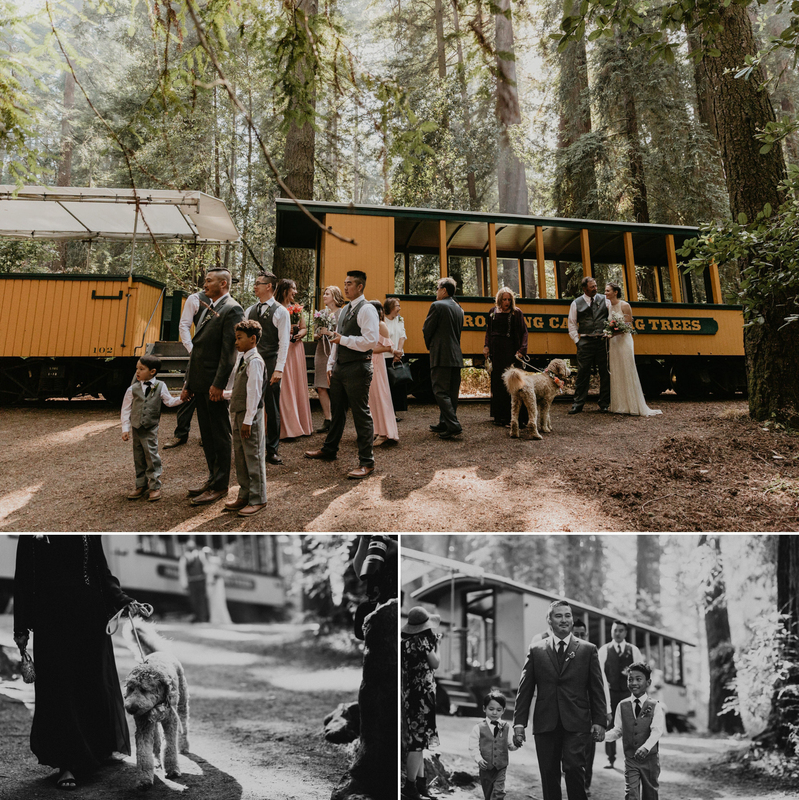 Everyone got on an old steam train to ride up to the ceremony site while the conductor gave us so much amazing information about the California redwoods. 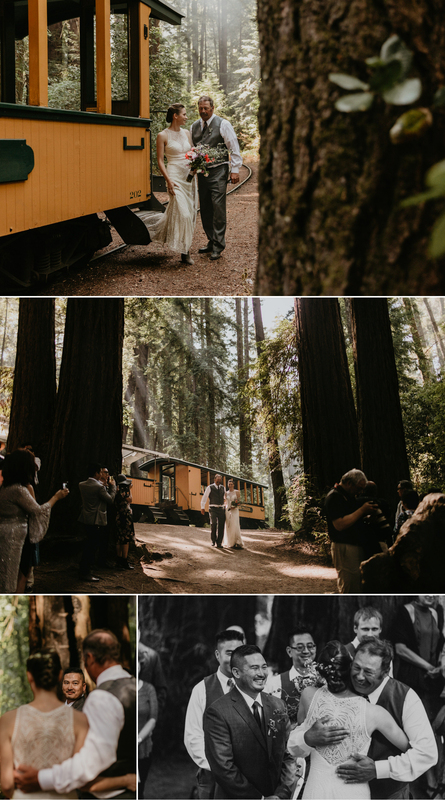 The train is open to the public when there isn’t a wedding going on and I highly suggest if you’re in the area that you take the time to ride it and learn about the majestic redwoods. 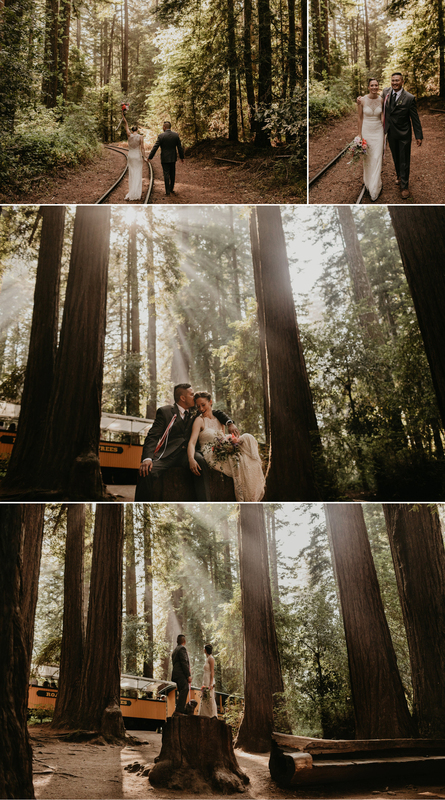 Everyone got off the train and was mesmerized by a majestic faerie circle of Cathedral Redwoods. 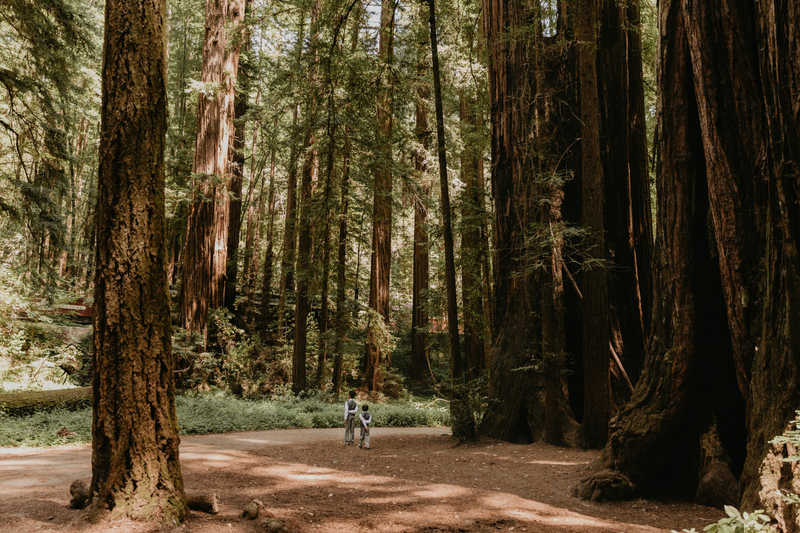 Certain kinds of redwoods grow in a circle like this around an old stump. 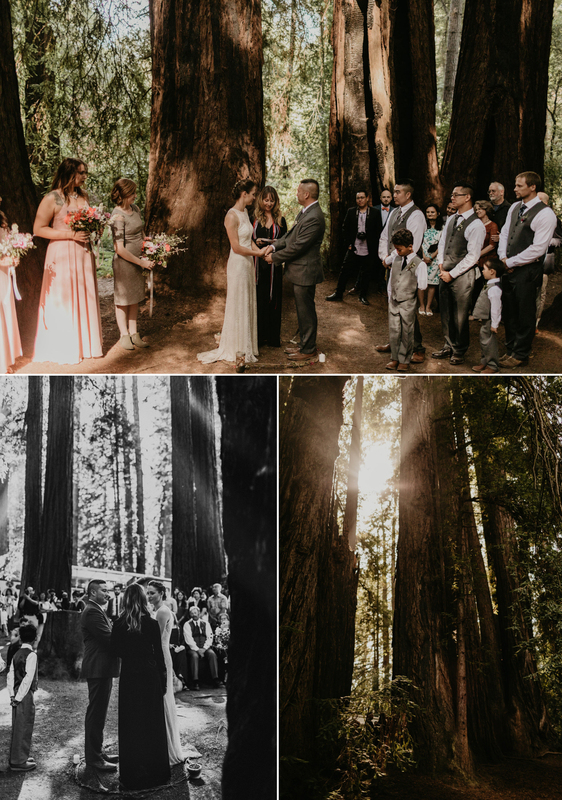 They entangle roots and support each other like a family. 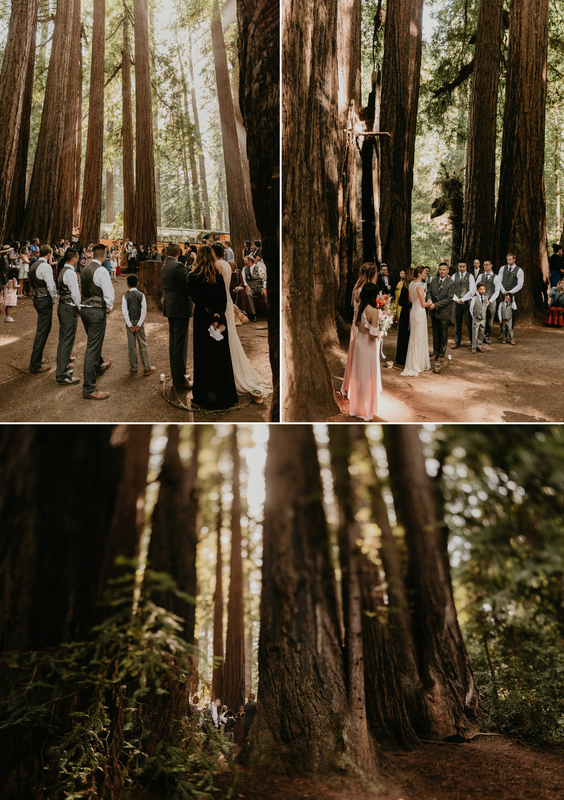 The couple’s guests gathered in a circle around where their ceremony would take place. 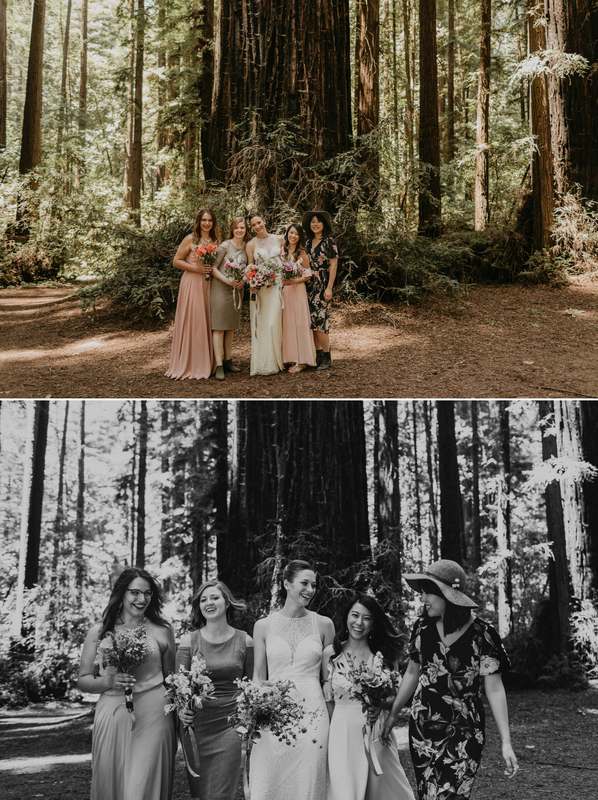 The couple chose a close friend to officiate the wedding, who was also Gayle’s doula. 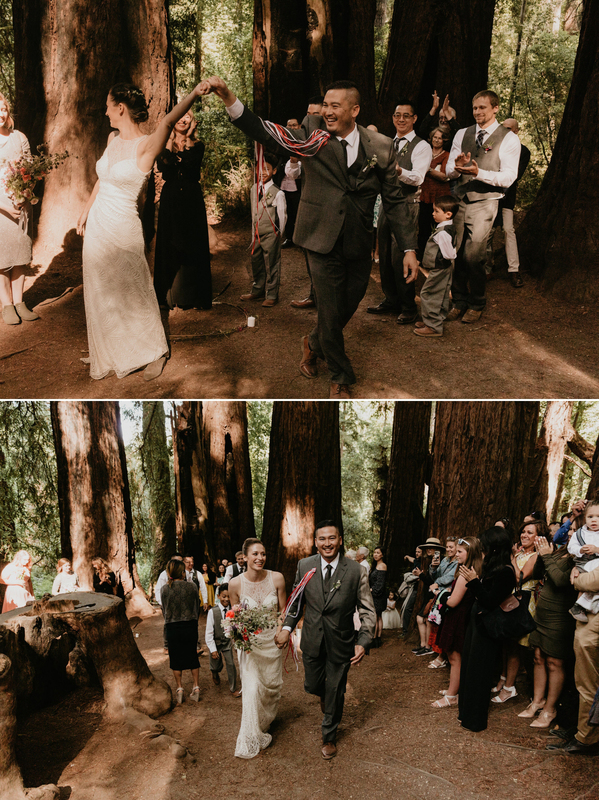 Her officiant is Irish so she helped the couple put together a Celtic style Handfasting ceremony. 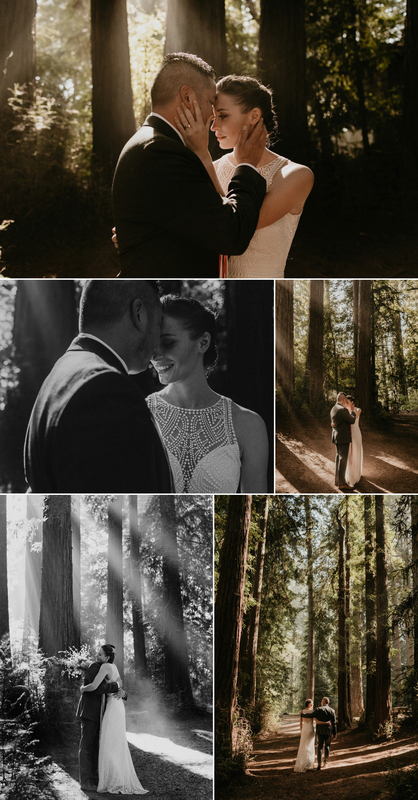 Their ceremony style was perfect to share their deep connection with nature and the community around them. 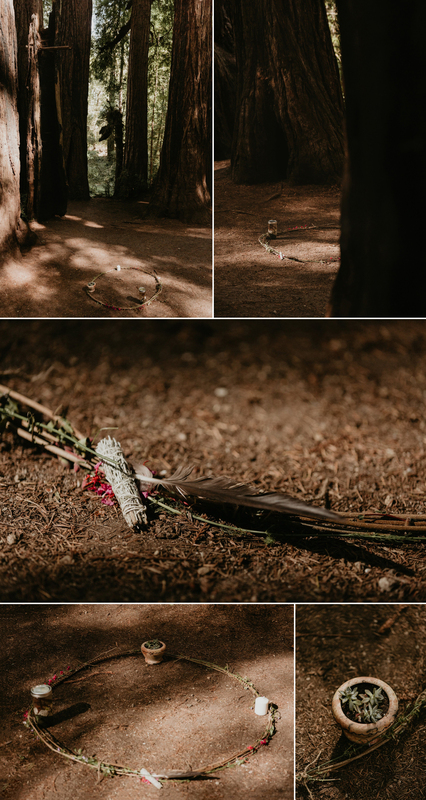 They designed a circle to stand in made up of twigs & some pieces of their lives. 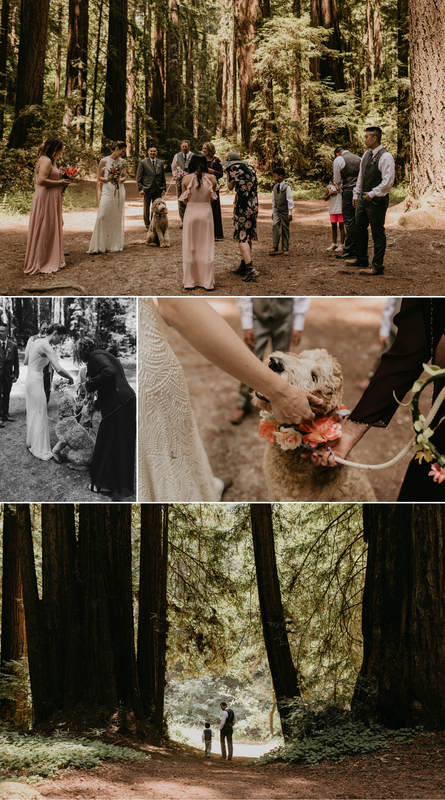 Traditionally in a handfasting ceremony, there are 4 candles to represent each of the four cardinal points, a candle for the sun, a candle for the moon, a candle for the couple, a bowl of water and a bowl of salt. 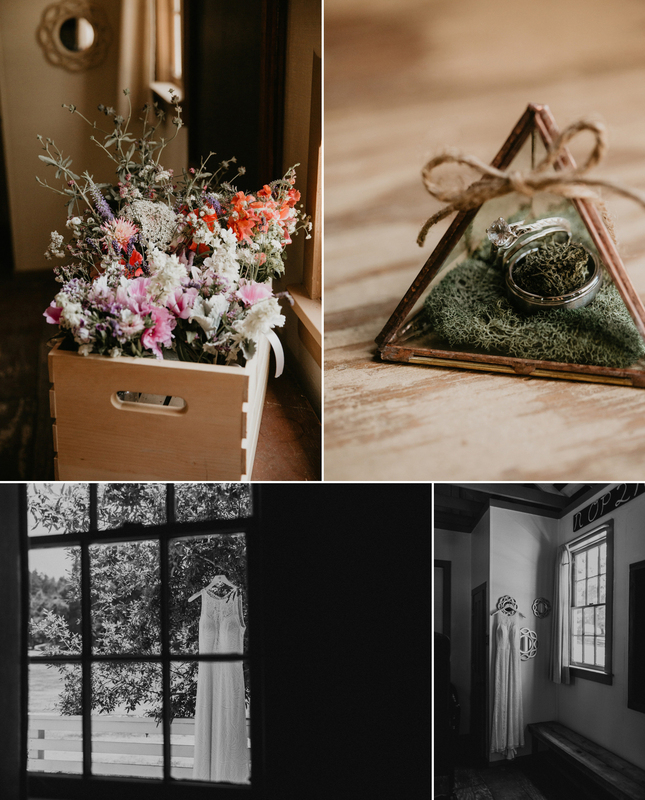 Gayle chose to make it a little more personal to them and used a candle, a feather and sage, a succulent, and a jar of ocean water with seashells. 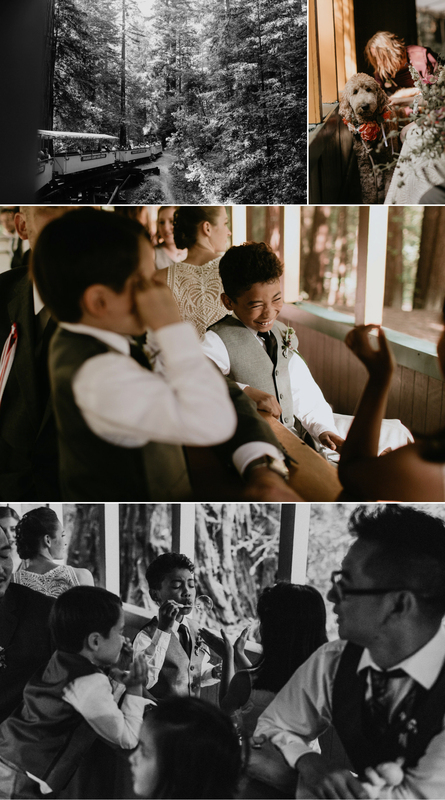 During the ceremony they passed their rings around to each of the guests and gave them an opportunity to make a wish or blessing for the couple. This is also called a “ring warming ceremony” and is another Irish tradition. 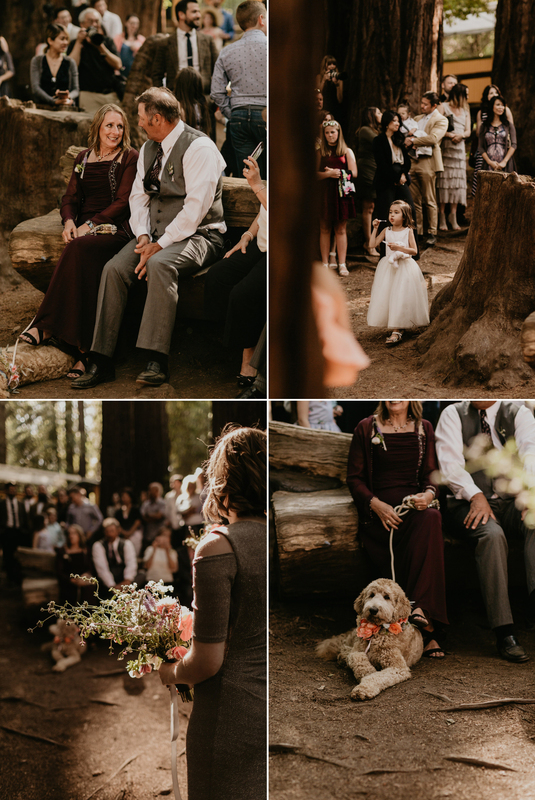 I loved this idea so much as it gave the guests a chance to really feel like they were a part of the ceremony. 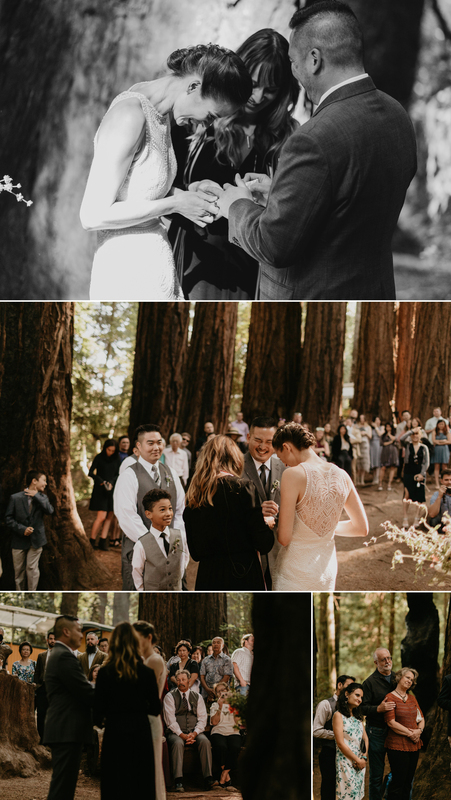 As they spoke beautiful and heartfelt vows to each other, a ribbon was cast over their hands for each promise. 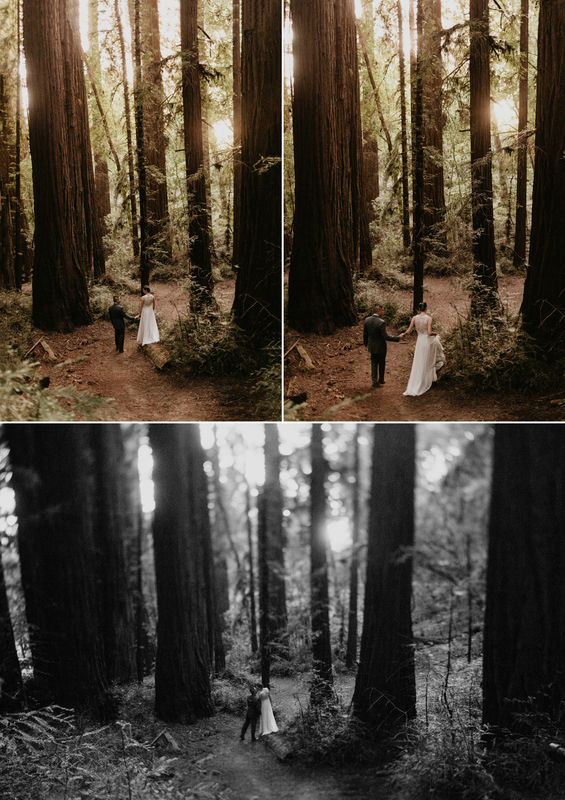 Once they finished, their officiant literally “tied the knot” over their entwined hands. 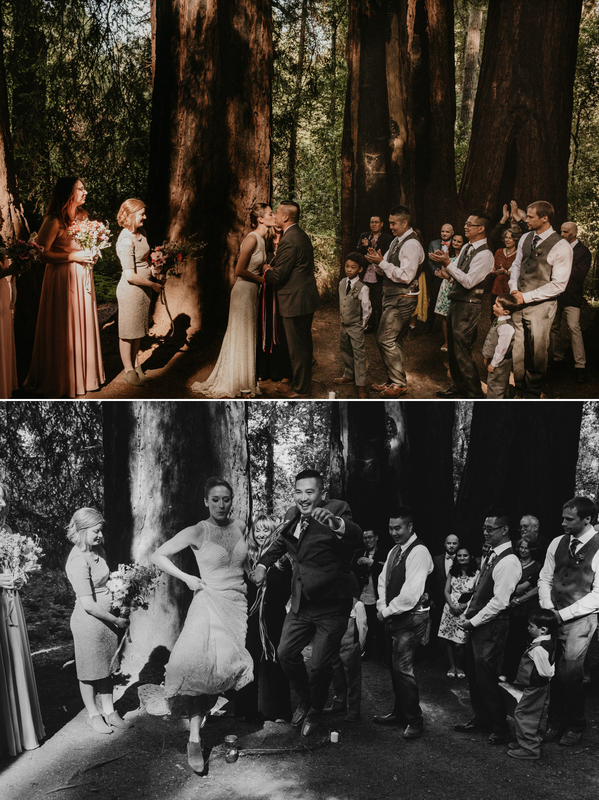 They kissed and jumped out of the circle they stood in while all of their guests cheered. 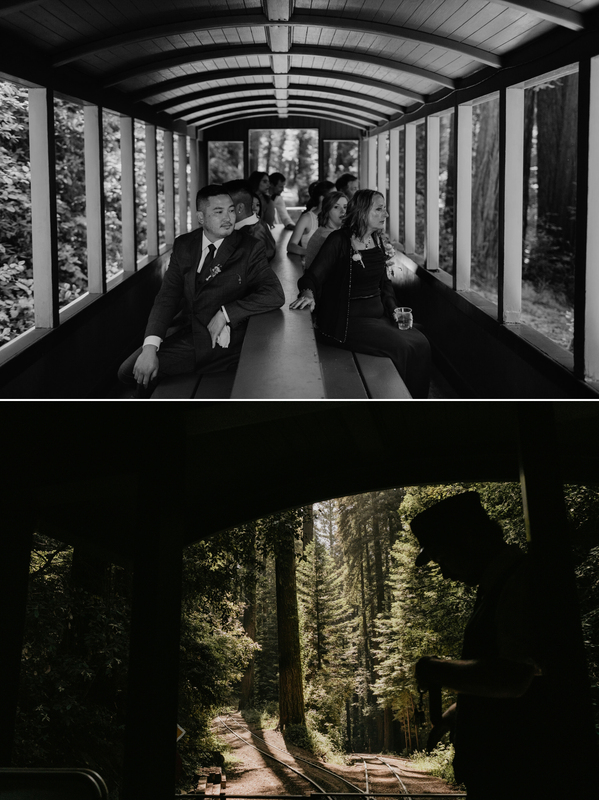 The train ride back down the mountain was filled with laughter and fun moments. 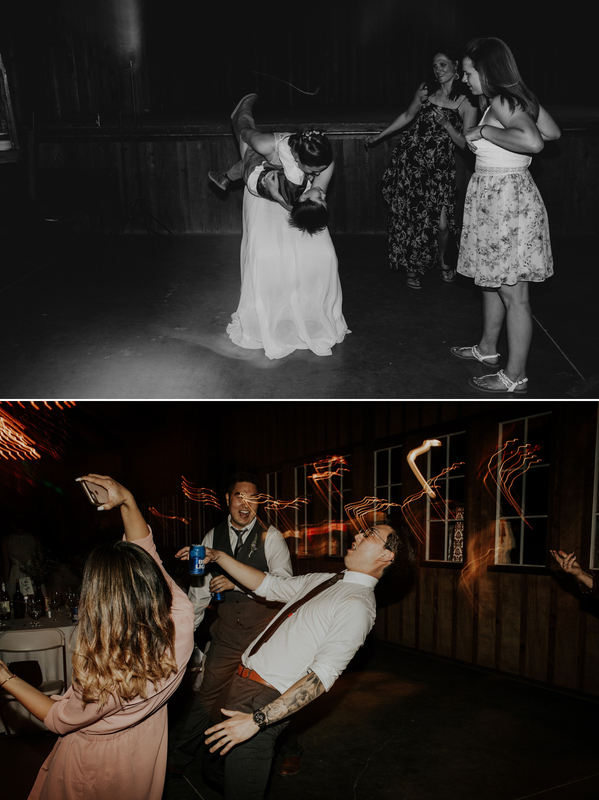 Their cocktail hour was decorated with lawn games and a craft coffee cart. 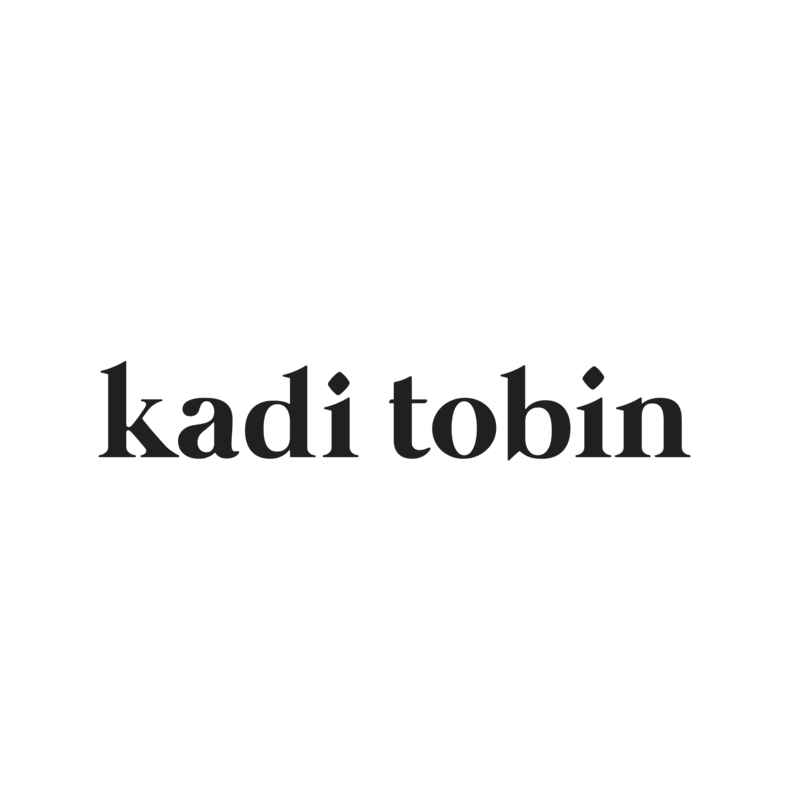 There was kombucha, craft beer, great wine, and all the La Croix your heart could dream of. 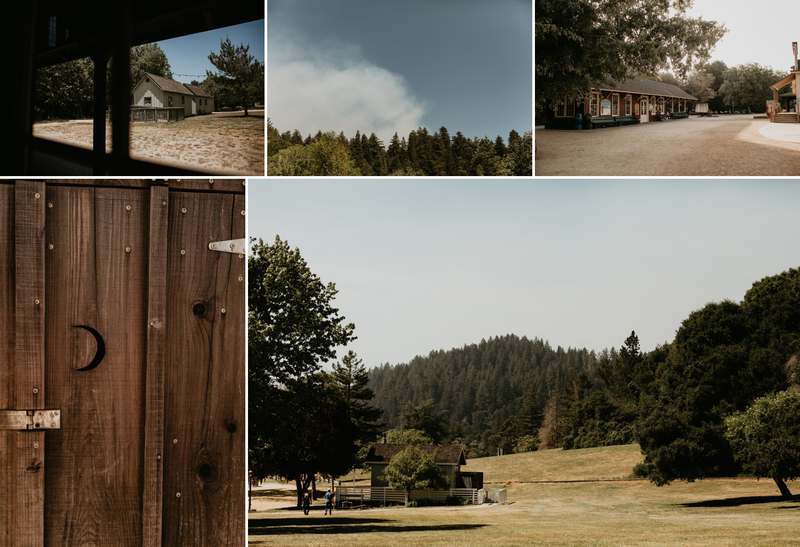 The dinner that Roaring Camp provided was delicious and tasted so fresh. For dessert there were a range of cupcakes, some vegan and gluten free and the guests also roasted marshmallows by the fire. 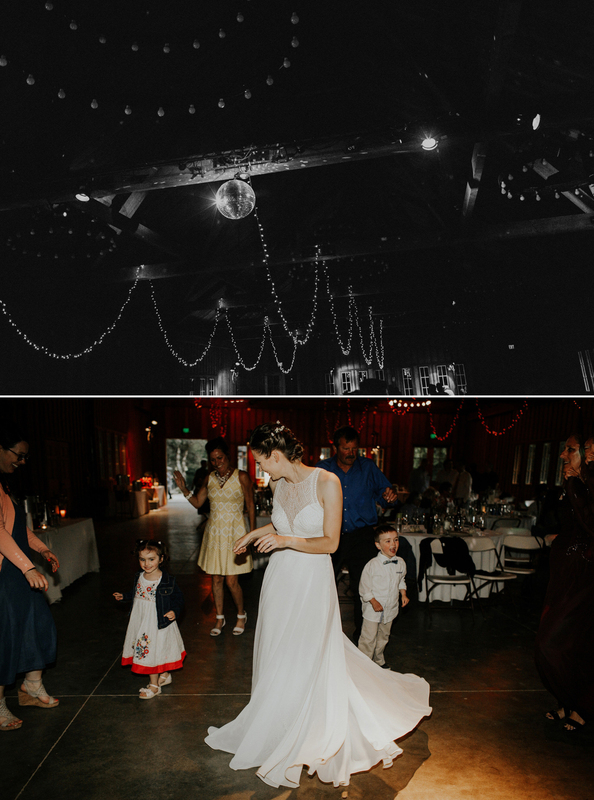 The bride loved the print of her BHLDN dress but really wanted something with a flowy skirt so she could twirl when she danced, she had a custom skirt designed to slip on over her dress for the reception. 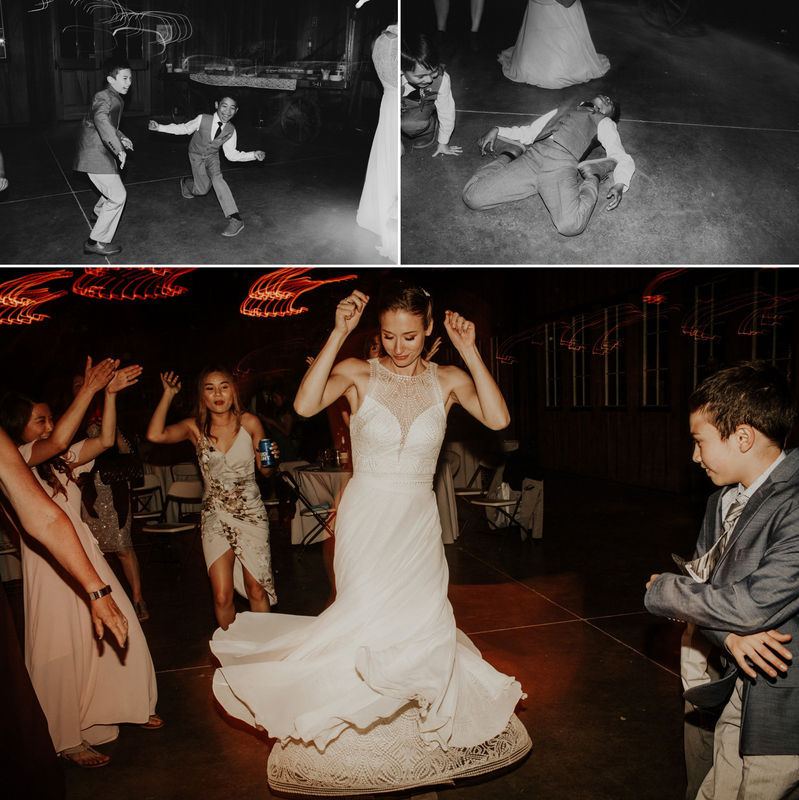 She surprised everyone and changed just before the dancing began. 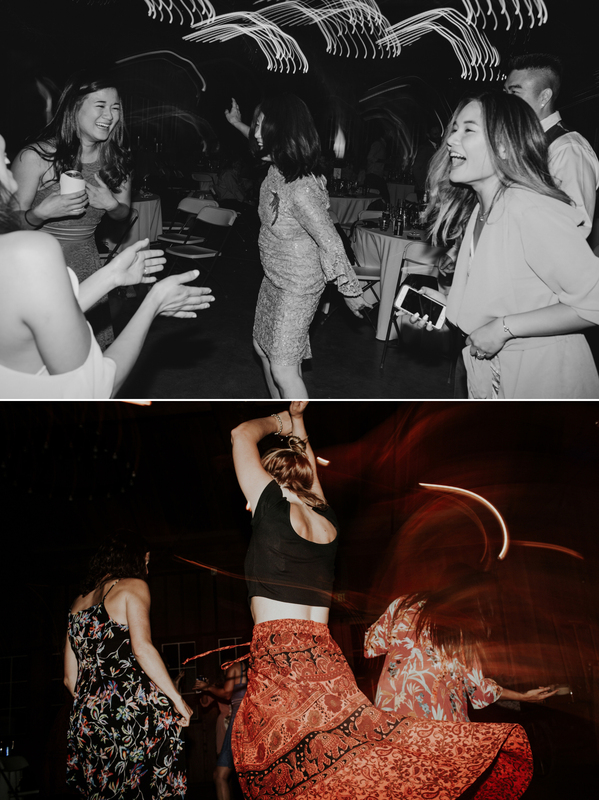 A discoball was hung in Brett Harte hall and everyone busted out their grooviest dance moves.